Description Avonmore is a creative and powerful multipurpose template which is suitable for any type of Agency, Portfolio, Design studio, Shop, Blog and much more. It looks great on tablets and mobile devices due to its responsive design. It comes loaded with various page types, includes unlimited color schemes, great amount of fonts, icons and more. Highest quality of code, extended and easy-to-read documentation, prompt and qualified support are the key features Avonmore is standing out with. It is super Clear, Clean, Creative, Modern and Newest design by GTCreators. This one will be an amazing choice! Template Features Home Main. Home Bakery. Home Corporate. Home Dancing. Home Hair Salon. Home Blog. Home Shop. Home Portfolio. 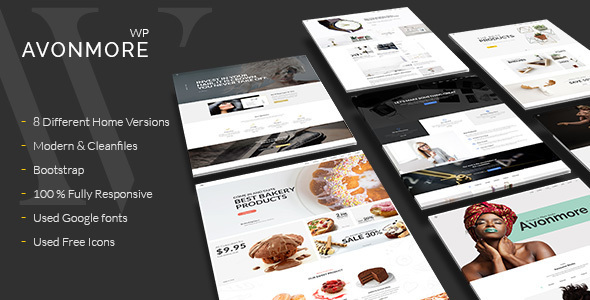 Compatible with WPML, WooCommerce 3.4.x, WooCommerce 3.3.x, WooCommerce 3.2.x, WooCommerce 3.1.x, WooCommerce 3.0.x, WooCommerce 2.6.x, WooCommerce 2.5, Events Calendar, Visual Composer 5.1.x, Visual Composer 4.12.x, Visual Composer 4.11.2.1, Visual Composer 4.11.x, Visual Composer 4.10.x. Avonmore has been tested with browsers IE9, IE10, IE11, Firefox, Safari, Opera, Chrome, Edge.